What's the best tech idea of 2009? According to David Pogue, READABILITY is a "real life-changer". I tried it with the Firefox browser. It’s a free button for your browser’s toolbar When you click it, Readability eliminates all the nonsense from whatever you are reading except the text and photos... no ads, no sidebars, no blinking, links, banners, promos or anything else. You select your own font size and margins for enjoyable reading. Pogue warns that occasionally Readability doesn’t handle some webpages correctly.All you do is refresh the page to see the original. Give it a try. You'll forget that you're reading from a screen. I liked some of the comments adding items which became obsolete this decade: fiscal responsibility! The nominations are up and voting is now open in the 2009 Edublog Awards. 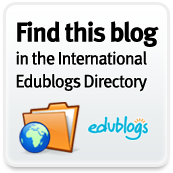 The Edublog Awards pulls together lists of excellent blogs / sites. These lists give you a one-stop shopping place for influential folks to follow online and are a great way of discovering hidden treasures and cool ideas on how these different social media tools can be used in an Educational context. I plan on sifting through many of these bloggers and tweeters to see who I am missing. And, please vote if for someone if they have been mentoring you online. It's payback time. Time to get started....take the time to peruse and vote. I guarantee that you'll be glad you did. News, made for the Web. The Living Stories project is an experiment in presenting news, one designed specifically for the online environment. The project was developed by Google in collaboration with two of the country's leading newspapers, The New York Times and The Washington Post. Complete coverage of an on-going story is gathered together and prioritized on one URL. You can now quickly navigate between news articles, opinion pieces and features without long waits for pages to load. Each story has an evolving summary of current developments as a well as an interactive timeline of critical events. Stories can be explored by themes, significant participants or multimedia. Updates to the story are highlighted each time you come back, and older news is summarized. This looks like it'll be a nice way to search, especially if you're not the best at keyboarding on a phone! Can't wait to try it on my Droid phone. Currently only available with the android operating systems. Quickly find relevant people to follow! 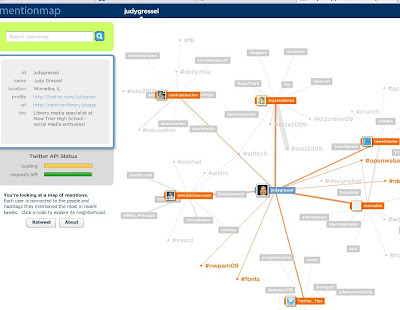 Use Mentionmap to see Twitter conversations as a network and click any user to explore. The key question for Rheingold is whether we have central or de-centralized control over networks. Watch and learn how design decisions have big implications. Here is Part I: about 12 minutes. If you're really interested, then watch Part II. While I know how useful the web is in promoting democracy, I had not previously thought about how network architecture relates to freedom. Dec 4, 2009 Danny Sullivan, Editor-In-Chief of the Search Engine Land website, is widely considered a leading "search engine guru". Sullivan reports, "Beginning today, Google will now personalize the search results of anyone who uses its search engine, regardless of whether they’ve opted-in to a previously existing personalization feature." Danny Sullivan explains how search personalization works, discusses privacy issues, and the differences between "Signed-Out Web History and Signed-In Web History". # Your browser itself records what you search on — and often, people fail to clear their browser histories. Sullivan shows you exactly how to opt out, which I did! You have to sign in to your Google account to opt out of this "service". I prefer to refine my own searching. View the Sports Illustrated Tablet demo! It's quite impressive on the Apple Tablet. Has features of the iphone or my new Droid. Actually, it's more like John King's magic wall on CNN. Digital publishing gone wild. Gotta love it. Thought everyone might enjoy this short clip produced by the Library at Brown University, especially since we are talking about research, both as part of the Curriculum Action Research underway in the English department and as we begin work for Junior Theme. The student here is featured in several videos – this one deals mostly with evaluating resources. I especially like Lee Kolbert's idea of using Google News Timeline to analyze how headlines have been changing over time. Web Faceoff: Overall Results--see today's challenge for Google v. Bing and vote!